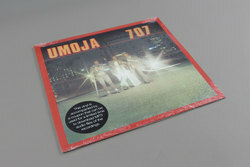 Umoja - 707. Vinyl LP, CD. Bleep. Awesome Tapes From Africa return with another essential reissue. This time from 1988 South Africa, comes Umoja (loosely translated from Swahili as unity or oneness) with a defining record in the music scene that defined the late-apartheid era in SA known as Bubblegum. The escapism associated with this highly danceable style of pop music is none more prevalent than in ‘Take Me High’ whose call and response vocals and earworm-y synth lines makes it an unstoppable dancefloor bubbler that follows from the squelchy synth and vocoder-heavy title track which is both pensive and uplifting. Joyful opening track ‘Money Money (Bananas)’ and the stomping yet smooth ‘Special Night’ round off an EP that dominated the pop charts and went double-platinum when originally released and still sounds great nearly 30 years later.